Oligofructose, also known as fructooligosaccharides, is a type of indigestible carbohydrate composed largely of fructose, or fruit sugar. 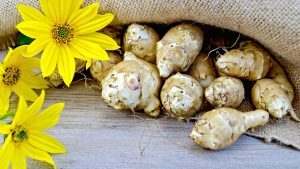 Additionally, it’s a kind of plant-based soluble fiber known as inulin, meaning that oligofructose isn’t digested by the intestines due to lack of necessary enzymes to break it down. Oligofrucose instead serves a prebiotic or food source for gut bacteria. As such, oligofructose is believed to yield many of the health benefits associated with prebiotics as a whole. These include improving digestive health, relieving constipation, and possibly aiding in weight loss. However, there have been numerous recorded side effects to oligofructose as well. Although prebiotics like oligofructose nourish good gut bacteria, they can do the same for bad gut bacteria too. One particular strain of bacteria, Klebsiella, has been connected to the increased incidences of intestinal permeability or leaky gut, a condition wherein the lining of the small intestine sustains damage and causes waste, undigested food particles, and bacteria to seep through the intestines and enter the bloodstream. This is on top of Klebsiella’s links to urinary tract and lung infections, and autoimmune conditions such as ankylosing spondylitis and rheumatoid arthritis. In addition to Klebsiella, oligofructose is believed to cause the overgrowth of other bacterial strains like Candida, Salmonella, Escherichia coli, and several species of Clostridium. An imbalance of gut bacteria can lead to a variety of digestive problems, including but not limited to bloating, flatulence, abdominal discomfort, and diarrhea. Taking more than 10 g of oligofructose a day has been found to lead to excessive flatulence and bloating. Certain individuals can be more vulnerable to the negative health effects of oligofructose. People with FODMAP (or Fermentable Oligo-, Di-, Mono-saccharides and Polyols) allergies fall under this category. Even a small amount of oligofructose can lead to these people experiencing diarrhea and gas. Sensitive individuals grappling with irritable bowel syndrome and fructose malabsorption count as having FODMAP allergies. Though rare, inulin has induced anaphylaxis or anaphylactic reactions in people with food allergies to this substance. Anaphylaxis is the most severe kind of allergic reaction which causes shortness of breath, vomiting, lightheadedness, hypotension or low blood pressure, and throat or tongue swelling. Left untreated, anaphylaxis can be fatal. As an indigestible carbohydrate, oligofructose can harm the digestive system, especially when consumed in amounts that exceed 10 g a day. The negative effects of oligofructose are more pronounced in sensitive individuals with conditions such as irritable bowel syndrome. Furthermore, oligofructose can be found in mass-manufactured of foods as a sugar substitute or as a part of dietary fibers. The best way to avoid oligofructose is to not eat any of the above mentioned foods and food products. Those who struggle with completely cutting these foods and food products out of their diets can simply limit their consumption. Oligofructose is an indigestible carbohydrate that can cause harm to the digestive system by encouraging the growth of bad gut bacteria. Having too much bad bacteria can then result in numerous digestive issues like flatulence, abdominal pain, and diarrhea. These effects are more pronounced among individuals who have FODMAP allergies like irritable bowel syndrome and fructose malabsorption. People with food allergies to inulin run the risk of experiencing anaphylaxis when consuming foods with oligofructose.